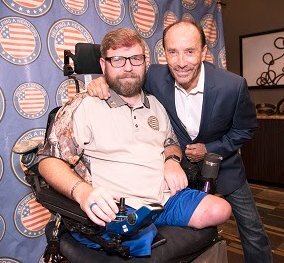 Grammy®-winning artist Lee Greenwood has been honored with the Point of Light Award. Created by the administration of President George H. W. Bush, the Daily Point of Light Award honors individuals and groups creating meaningful change in communities across America. Greenwood, who was recently named one of Billboard's 100 Greatest Country Artists of All Time, has done over 30 tours with the USO and is an ambassador for non-profit organization, Help A Hero. Despite his great musical success, Greenwood says he is most proud of what he can give back to his country and those who have served. Greenwood was presented the Points of Light Award on August 21 by the Chairman of Helping a Hero, Chris Daniel. Points of Light works in partnership with companies, foundations, government agencies and nonprofits to achieve the greatest impact. Lee Greenwood continues to spread his patriotism through his current tour across America. For more information on Lee Greenwood, please visit leegreenwood.com and follow him on Twitter, Facebook and Instagram. Throughout his expansive career, international country music icon Lee Greenwood has earned multiple CMA and ACM Awards, a Grammy Award for Top Male Vocal Performance on "I.O.U," in 1985, and a multitude of other prestigious award nominations. His discography includes twenty-two studio albums, seven compilation albums, seven No. 1 hits and thirty-eight singles including songs like “It Turns Me Inside Out,” “Ring On Her Finger Time on Her Hand,” “She’s Lyin,” “I Don’t Mind the Thorns If You’re the Rose,” “Dixie Road,” “Somebody’s Gonna Love You,” “Going Going Gone,” “You Got A Good Love Comin,” among others. His stand-out hit "God Bless the U.S.A." has been in the top five on the country singles charts three times (1991, 2001 and 2003), giving it the distinction of being the only song in any genre of music to achieve that feat. It was also No. 1 on the pop charts after 9/11. Known for his stand-out patriotism and support of the U.S. Military, Greenwood has been honored with the Congressional Medal of Honor Society's National Patriot’s Award, and entertained troops on more than 30 USO Tours. His latest book release is a children’s book called “Proud To Be An American,” which is currently available in stores, on Amazon and LeeGreenwood.com.